Sometimes I like to leave my wine choices to other people. By chatting to sommeliers and knowledgeable staff at wine merchants I’ll end up trying wines I may not otherwise have given the time of day to. I may never have tried the fruity, spicy Heinrich Blaufrankisch or the voluptuous Rabl Grüner Veltliner if they hadn’t been recommendations from Wimbledon Wine Cellar. It’s not always successful. I was underwhelmed by two Friulanos I had recently (maybe they’re just not my thing) and a Nero D’Avola/Frappato blend was just too bitter for me. But then we opened a Tanca Farra’ Alghero 2005 from Sardinian winemakers (and now part of Campari) Sella& Mosca. Tanca Farra’ is an elegant blend of Cabernet and Cannonau, the local name for Grenache. It smelt and tasted like morello cherries and cabbage leaves, and burst into black cherries on the palate, still with some vegetal hints and a slug of polished leather. Unusually for an Italian wine, it was very drinkable on its own but it went brilliantly with a veal lasagne. 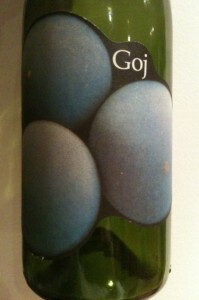 Elegant is not the word I’d use to describe a Barbera called Goj,which means ‘joy’ in the local dialect. Although the bottle we drank was from 1999, it was still quite cheeky and spritzy on opening, oozing juicy blackberries which, after 20 minutes, morphed into black treacle flavours. Not at all complex but a tasty, fun weeknight drinker. I would like to try a younger bottle to see how it compares. 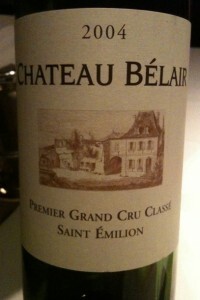 In sharp contrast, a sommelier at La Trompette pointed us towards a 2004 Chateau Belair Saint Emilion. To be fair, her first choice was a red blend from Alto Adige, but I really wanted a change from Italian and was in the mood for some stonking classic French. And Chateau Belair delivered. A little uptight at first but, over the course of dinner, it transitioned from cedar, prunes and eucalyptus to soft black plums, vanilla and a hint of mint. We matched it with a raviolo crammed with pork and some English lamb. 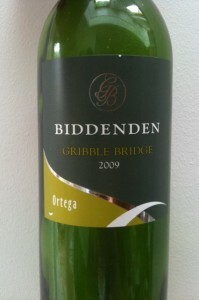 Then we drank a wine we’d chosen all on our very own, Gribble Bridge Ortega Dry 2009. Or perhaps I was strongly persuaded to try it by the ladies in the shop at Biddenden Vineyards where we swung by on a recent jaunt to Kent. However it ended up in my possession, I’m glad it did. Ortega is quite a full, floral grape which just loves British weather – and clearly the Kentish countryside. This was Kent in a glass. Apples, pears, a bit of honey and I swear some strawberries with a pinch of white pepper to temper the fruitiness. For anyone who thinks English wine can be a bit wimpy, this will absolutely change their minds. Hi Paola, what do you think of the wines from Muscadet or Picpoul? I have been addicted to them lately and love it. Are there others similar you would recommend. Both are crisp and refreshing but with some nice fruity flavours, and the perfect with oysters and other shellfish. If you like these summery whites, then you might like to head a little further inland from Muscadet country and try Saumur Blanc (made from Chenin Blanc). Outside France, you might like to try some Albariño, from North West Spain and or some Grüner Veltliner from Austria. Both can range in styles from young and crisp to more full bodied, but the label (or a good wine merchant) should help you. And give Australia Rieslings a go from Victoria, Tasmania and South Australia’s Clare Valley. Let me know how you get on.